The easiest (but not the cheapest) way to travel from Schiphol Airport to Zwanenburgwal 296 is by taxi (costs about € 50,-). If you use a taxi: show the complete address to the taxi driver and make it clear you do NOT want to go to a small village outside of Amsterdam called Zwanenburg, but to this address: Zwanenburgwal 296 right in the city center of Amsterdam next to the Muziektheater on the Amstel river! Public transport from Schiphol Airport is fast and cheap. Purchase a ticket at the ticket office in the main hall of the airport. Do NOT get on the train without a ticket as it is not possible to purchase normal tickets on the train rather, you will have to pay for a ticket that is 3-times the normal price as a penalty. The yellow automatic ticket machines in the baggage area and upstairs in the main hall do not take US credit or debit cards. You have to go to the ticket office in the main hall. Once you have your ticket, look for the track that has trains going to Amsterdam Central Railway Station. To take the train from Schiphol Airport go to the appropriate platform underneath the main Schiphol entrance hall; trains leave about every 10 minutes, they take about 15 min. and cost about € 4,50/p.p.) to Amsterdam Central Station. 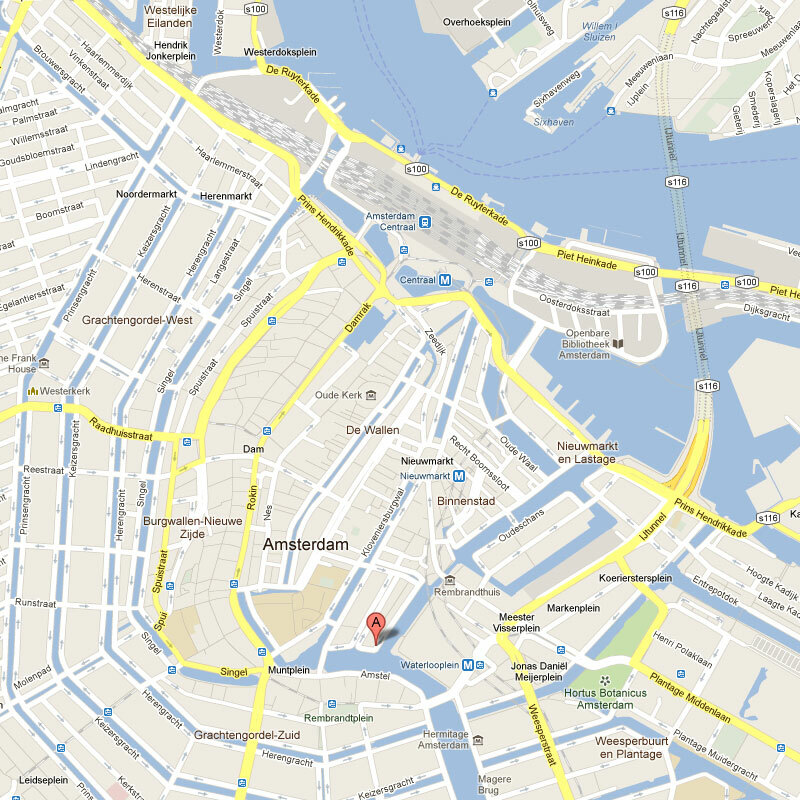 – take a taxi (costs about € 13.-) Do show the complete address to the taxi driver and make it clear you want to go to Zwanenburgwal 296 right in the city center of Amsterdam = next to the Muziektheater on the Amstel river! – take the street tram lines 4 or 14 towards the Rembrandtplein (3rd stop) for which you can buy a ticket from the conductor located halfway the tram. If you plan to use the metro and or tram during your stay, you may consider purchasing an I Amsterdam Card at the Tourist Bureau just outside Amsterdam Central Railway Station, or a refillable transportation card in the underground metro entrance that is cheaper than a one hour ticket. Click on by foot for details on how to walk from Waterlooplein or Rembrandtplein to Amsterdam Canal Guest Apartment at Zwanenburgwal 296.